The State Championships and therefore qualification race for the German Championships were held in Nussdorf. The Club MSC Strudelbachtal prepared the track perfectly despite of heavy storms the days leading to the race. In tropical temperatures it was time to fight for the titles! 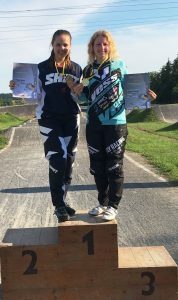 Regula Runge, 14-times German Champion and 2017 #2 at German Championships, was looking forward to race on one of her favourite tracks.